Mass gatherings (MGs) occur worldwide on any given day, yet mass-gathering health (MGH) is a relatively new field of scientific inquiry. As the science underpinning, the study of MGH continues to develop, there will be increasing opportunities to improve health and safety of those attending events. The emerging body of MG literature demonstrates considerable variation in the collection and reporting of data. This complicates comparison across settings and limits the value and utility of these reported data. Standardization of data points and/or reporting in relation to events would aid in creating a robust evidence base from which governments, researchers, clinicians, and event planners could benefit.Moving towards international consensus on any topic is a complex undertaking. 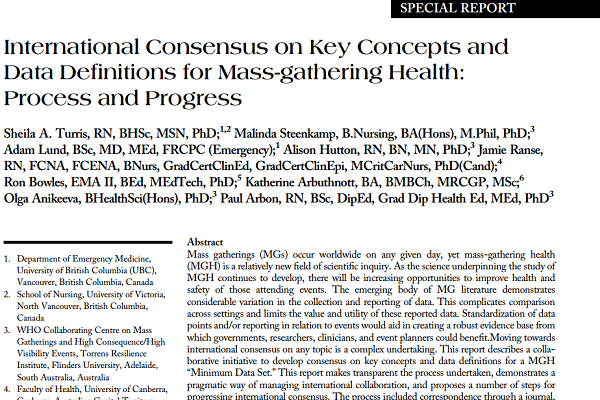 This report describes a collaborative initiative to develop consensus on key concepts and data definitions for a MGH “Minimum Data Set.” This report makes transparent the process undertaken, demonstrates a pragmatic way of managing international collaboration, and proposes a number of steps for progressing international consensus. The process included correspondence through a journal, face-to-face meetings at a conference, then a four-day working meeting; virtual meetings over a two-year period supported by online project management tools; consultation with an international group of MGH researchers via an online Delphi process; and a workshop delivered at the 19thWorld Congress on Disaster and Emergency Medicine held in Cape Town, South Africa in April 2015. This resulted in an agreement by workshop participants that there is a need for international consensus on key concepts and data definitions. Turris S, Steenkamp M, Lund A, Hutton A, Ranse J, Bowles R, Aruthnott K, Anikeeva O, Arbon P. (2016). International consensus on key concepts and data definitions for mass gathering health: Process and progress. Prehospital Disaster Medicine. 31(2):1-4.